We have a good thing going in my family. We all like mayonnaise and bearnaise sauce A LOT so we use a lot of egg yolks. Not wanting to waste food the egg whites go into little containers in the fridge (they keep for weeks!). 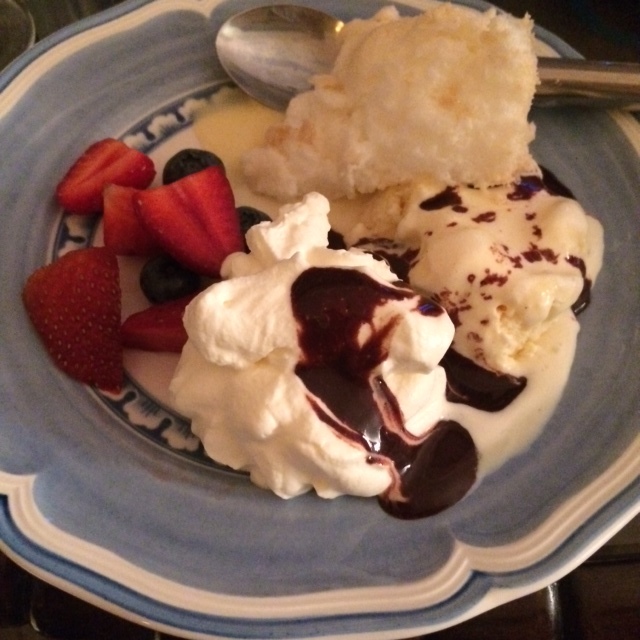 But conveniently my dad loves everything meringue-y so we get to use up the egg whites quite frequently too. 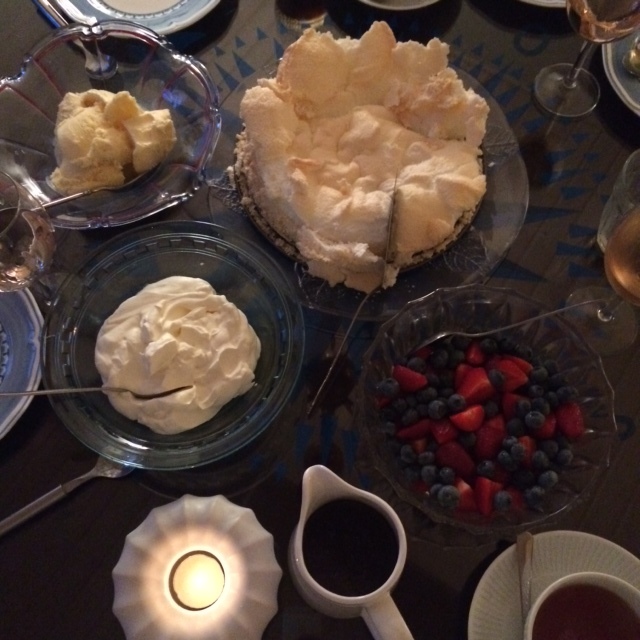 The whole little family (there’s only three of us; mother, father and me) loved this rhubarb meringue pie. It still has the tang of a lemon meringue pie but is slightly less heavy as no butter or egg yolk in the rhubarb filling. The pie on the pictures had approx 500 g rhubarb in the filling which was fine taste wise but looked a little silly with all that meringue, so in the recipe below I’ve adjusted the recipe to 800 g rhubarb. It cooks down a lot in the oven, so I promise it’s not too much. Also, when making the meringue, please note that it needs a lot of beating with an electric whisk and that it’s important the syrup boils and reaches (or almost reaches) 118C. Mix all the ingredients to the dough in a bowl or using a food processor. Press into a Ø 20 cm pie dish. Bake in a low oven using baking beads at 180C, for approx 10-15 minutes or until golden and baked through. Leave to cool. Place the defrosted rhubarb pieces in an ovenproof dish and scatter with potato flour and sugar. If using fresh rhubarb I would start off by using less potato flour adding more if needed. Place in a 200 C oven for approx 20 minuter. The mixture should be bubbling, almost caramelised and thickened. Leave to cool. Make the meringue: Add egg whites and sugar to a clean bowl and beat for 10 minutes with an electric whisk. Meanwhile make the syrup by adding water and sugar to a saucepan and bring to the boil (don’t stir). Remove when 118C (the boiling point for sugar). Add the hot syrup to the meringue and beat for a further 15 minutes, until you have a thick and glossy meringue. Assemble: Add the rhubarb mixture to the pie crust once both are cool. Spread the meringue on top and burn the edges with a brulee torch. Serve with lightly whipped cream. I made this lovely Winter version of Pavlova before Christmas, and if I had had time to post it before the holiday season I would have aptly named it Christmas Pavlova, but, as it’s now February, I think Winter Pavlova is more fitting. Clementines are still in season so nothing’s stopping you to make it right away. Or why not try it with blood oranges? Zest the clementines and squeeze out the juice. Place in a saucepan with the butter and half the sugar. Heat up until the butter and sugar has dissolved. Leave to cool. Beat egg and remaining sugar pale and fluffy and add to the saucepan. Let the mixture thicken on low heat while stirring. It must not boil. Leave to cool. Store in the fridge. Beat the egg whites until foamy and add the sugar bit by bit while beating until stiff peaks. Add corn flour and vinegar and fold it in with a spatula. Divide the meringue in two, shaping two circles on two parchment clad baking trays. Bake in the middle of the oven, for 60 minutes. Turn the oven off and leave the meringues in the cooling oven with the door open until the oven has cooled down. Lightly whip the cream and cut the clementines into fillets (peel it, keep it whole and place a knife on either side of each membrane, cutting out membrane-free wedges). Place one meringue round on a cake plate. Spread with clementine curd. Spread with whipped cream and place the other meringue round on top. Spread with whipped cream and decorate with clementine fillets and pomegranate seeds. 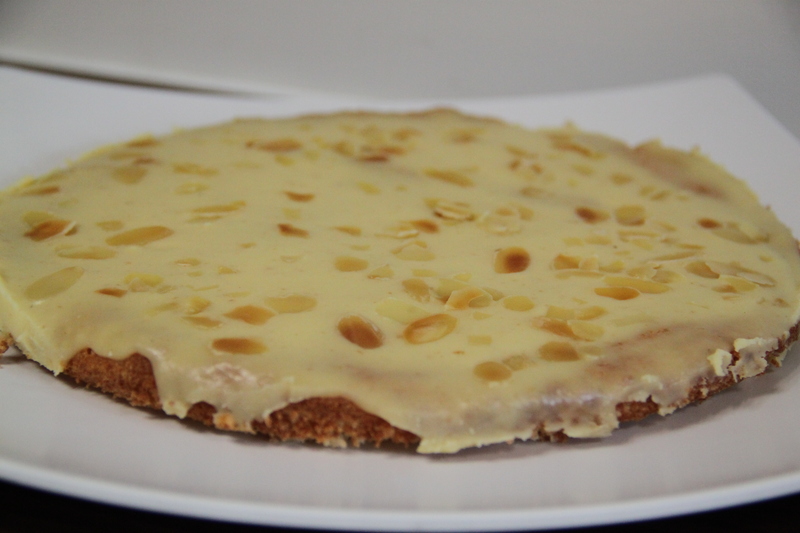 When I last baked for the office, this cake from the Swedish baking bible Swedish Cakes and Cookies, was very popular. I have a similar recipe on the blog already, that I must say I prefer, but it is always fun to try different recipes and make comparisons. This is still a very nice cake, it’s smaller than the other recipe and especially the custard tastes different, almost lighter actually. From Sju Sorters Kakor (the Swedish version of Swedish Cakes and Cookies). BUtter a regular cake tin. Beat the egg whites stiff. Mix the ground almonds and sugar in a bowl and fold in the stiff egg whites. Spread out the mixture in the tin. Bake in the bottom of the oven, 160C (fan oven) for 30 minutes. Leave to cool. Mix egg yolks, sugar, cream and butter in a saucepan. Simmer until thick while stirring. Leave to cool a little. Pour over the base. Garnish with almond slivers. Best served really cold.